Hi! I'm thinking of a random number between 1 and 100. Aw, you ran out of tries. The number was 11. Wait, what does this have to do with graphics and video games? A lot. Each frame the game displays is one time through a loop. You may be familiar with the frames-per-second (FPS) statistic that games show. 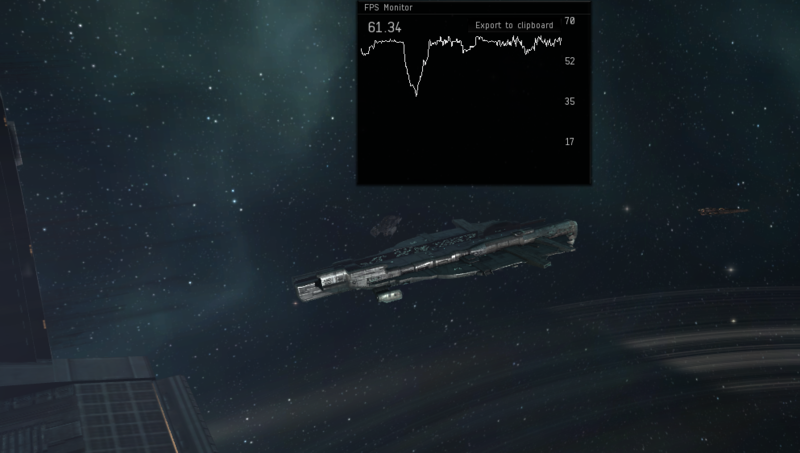 The FPS represents the number of times the computer updates the screen each second. The higher the rate, the smoother the game. (Although an FPS rate past 60 is faster than most screens can update, so there isn't much point to push it past that.) Figure 4.1 shows the game Eve Online and a graph showing how many frames per second the computer is able to display. The loop in these games works like the flowchart in Figure 4.2. Despite the complexities of modern games, the inside of this loop is similar to the calculator program we did in Chapter 1. Get user input. Perform calculations. Output the result. In a video game, we try to repeat this up to 60 times per second. There can even be loops inside of other loops. 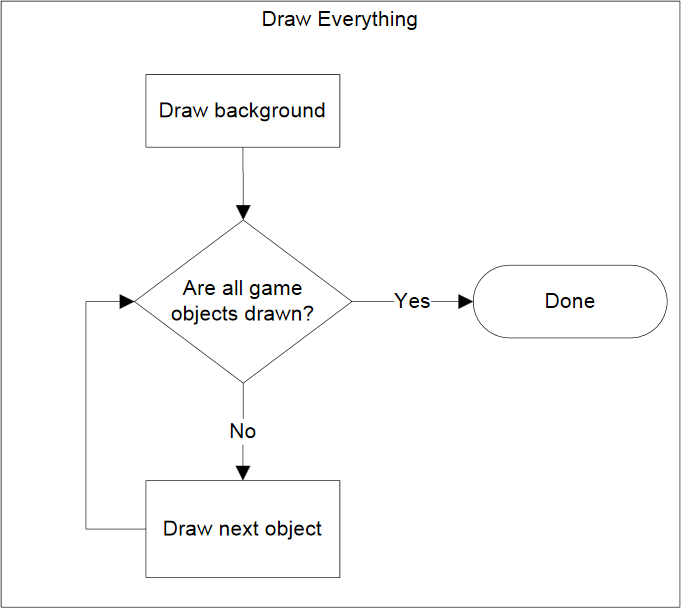 A real “loop the loop.” Take a look at the “Draw Everything” box in Figure 4.2. This set of code loops through and draws each object in the game. That loop is inside of the larger loop that draws each frame of the game, which looks like Figure 4.3. There are two major types of loops in Python, for loops and while loops. If you want to repeat a certain number of times, use a for loop. If you want to repeat until something happens (like the user hits the quit button) then use a while loop. For example, a for loop can be used to print all student records since the computer knows how many students there are. A while loop would need to be used to check for when a user hits the mouse button since the computer has no idea how long it will have to wait. The for loop example below runs the print statement five times. It could just as easily run 100 or 1,000,000 times just by changing the 5 to the desired number of times to loop. Note the similarities of how the for loop is written to the if statement. Both end in a colon, and both use indentation to specify which lines are affected by the statement. The i on line 1 is a variable that keeps track of how many times the program has looped. It is a new variable and can be named any legal variable name. Programmers often use i as for the variable name, because the i is short for increment. This variable helps track when the loop should end. The range function controls how many times the code in the loop is run. In this case, five times. The next example code will print “Please,” five times and “Can I go to the mall?” only once. “Can I go to the mall?” is not indented so it is not part of the for loop and will not print until the for loop completes. This next code example takes the prior example and indents line 3. This change will cause the program to print “Please," and "Can I go to the mall?” five times. Since the statement has been indented “Can I go to the mall?” is now part of the for loop and will repeat five times just like the word “Please,". The code below will print the numbers 0 to 9. Notice that the loop starts at 0 and does not include the number 10. It is natural to assume that range(10) would include 10, but it stops just short of it. A program does not need to name the variable i, it could be named something else. For example a programmer might use lineNumber if she was processing a text file. If a programmer wants to go from 1 to 10 instead of 0 to 9, there are a couple ways to do it. The first way is to send the range function two numbers instead of one. The first number is the starting value, the second is just beyond the ending value. It does take some practice to get used to the idea that the for loop will include the first number, but not the second number listed. The example below specifies a range of (1,11), and the numbers 1 to 10 are printed. The starting number 1 is included, but not the ending number of 11. Another way to print the numbers 1 to 10 is to still use range(10) and have the variable i go from 0 to 9. But just before printing out the variable the programmer adds one to it. This also works to print the numbers 1 to 10. Either method works just fine. If the program needs to count by 2's or use some other increment, that is easy. Just like before there are two ways to do it. The easiest is to supply a third number to the range function that tells it to count by 2's. The second way to do it is to go ahead and count by 1's, but multiply the variable by 2. The code example below shows both methods. It is also possible to count backwards down towards zero by giving the range function a negative step. In the example below, start at 10, go down to but not including 0, and do it by -1 increments. The hardest part of creating these loops is to accidentally switch the start and end numbers. The program starts at the larger value, so it goes first. Normal for loops that count up start with the smallest value listed first in the range function. Try to predict what the code below will print. Then enter the code and see if you are correct. This next block of code is almost identical to the one above. The second for loop has been indented one tab stop so that it is now nested inside of the first for loop. This changes how the code runs significantly. Try it and see. I'm not going to tell you what the code does, go to a computer and see. A common operation in working with loops is to keep a running total. This “running total” code pattern is used a lot in this book. Keep a running total of a score, total a person's account transactions, use a total to find an average, etc. You might want to bookmark this code listing because we'll refer back to it several times. In the code below, the user enters five numbers and the code totals up their values. Note that line 1 creates the variable total, and sets it to an initial amount of zero. It is easy to forget the need to create and initialize the variable to zero. Without it the computer will complain when it hits line 4. It doesn't know how to add new_number to total because total hasn't been given a value yet. A common mistake is to use i to total instead of new_number. Remember, we are keeping a running total of the values entered by the user, not a running total of the current loop count. The code below adds all the numbers from 1 to 100. It demonstrates a common pattern where a running total is kept inside of a loop. This also uses a separate variable sum to track the running total. A programmer that understands the nested for loops and running totals should be able to predict the output of the code below. Don't go over this section too fast. Give it a try and predict the output of the code above. Then copy it into a Python program and run it to see if you are right. If you aren't, figure out why. This example code covers common for loops and shows how they work. A for loop is used when a program knows it needs to repeat a block of code for a certain number of times. A while loop is used when a program needs to loop until a particular condition occurs. Line 1 of the while loop sets up a “sentinel” variable that will be used to count the number of times the loop has been executed. This happens automatically in a for loop eliminating one line of code. Line 2 contains the actual while loop. The format of the while loop is very similar to the if statement. If the condition holds, the code in the loop will repeat. Line 4 adds to the increment value. In a for loop this happens automatically, eliminating another line of code. As one can see from the code, the for loop is more compact than a while loop and is easier to read. Otherwise programs would do everything with a while loop. A common mistake is to confuse the for loop and the while loop. The code below shows a programmer that can't quite make up his/her mind between a for loop or a while loop. The range function only works with the for loop. Do not use it with the while loop! This isn't perfect though, because if the user says she wants to quit, the code will still ask if she wants to attack the dragon. How could you fix this? The programmer wants to count down from 10. What is wrong and how can it be fixed? What is wrong with this loop that tries to count to 10? What will happen when it is run? How should it be fixed? 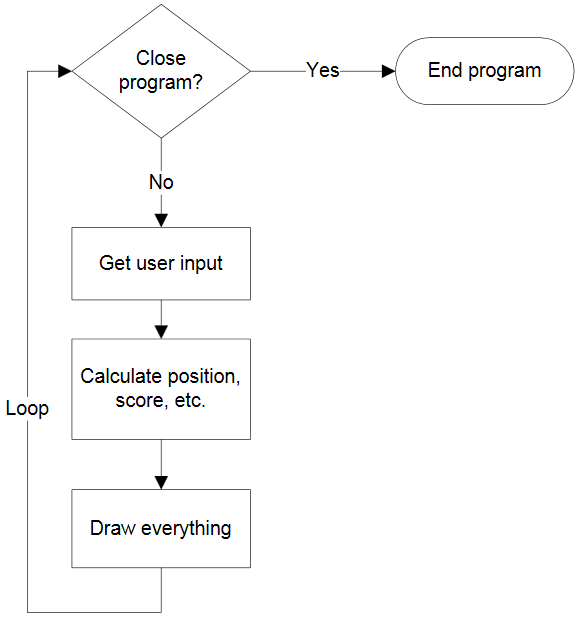 Here's a program that covers the different uses of the while loop that we just talked about. Random numbers are heavily used in computer science for programs that involve games or simulations. Just like with pygame, it is important not to create a file with the same name as what is being imported. Creating a file called random.py will cause Python to start importing that file instead of the system library that creates random numbers. After this, random numbers can be created with the randrange function. For example, this code creates random numbers from 0 to 49. By default the lower bound is 0. The next code example generates random numbers from 100 to 200. Just like the range function the second parameter specifies an upper-bound that is not inclusive. Therefore if you want random numbers up to and including 200, specify 201. All of the prior code generates integer numbers. If a floating point number is desired, a programmer may use the random function. The code below generates a random number from 0 to 1 such as 0.4355991106620656.